This week’s news on the regulatory front is mostly depressing, but thankfully we have some exciting new cigar releases to report to make up for it. Read on to find out what’s been going on in the cigar world. Cuba’s 2016 Edicion Limitadas Trinidad Topes and Romeo y Julieta Capuletos are now being distributed to Casa del Habano stores around the globe. The third Edicion Limitada, the Montecristo Dantes, still has not made its way to stores, but one Casa del Habano owner in Germany has indicated that he should be able to start selling them to customers on the 1st of December. 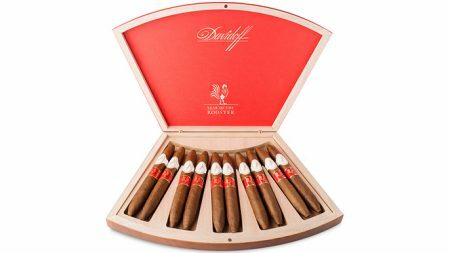 To honor the Year of the Rooster, Davidoff of Geneva is introducing a limited-edition cigar to celebrate the Chinese New Year. These cigars are immediately eye-catching thanks to their unusual diadema figurado shape. The cigar measures 6 ¾ x 50, and will come in boxes of 10 at a cost of $40 per cigar. Along with this limited edition line of cigars, a line of Year of the Rooster accessories is also being produced. This includes a double-guillotine cutter which you can purchase in either steel or rose gold as well as a carrying case in red leather. 8,000 Year of the Rooster boxes are being produced. Rocky Patel is now formally distributing the Dark Dominican. While the manufacturer has provided no information about the wrapper, binder or filler, retailers are stating that the cigar is a Dominican puro. Four sizes are available: Churchill, Robusto, Corona and Supremo. Tabacalera USA has just acquired a Houston-based chain of retail stores called Serious Cigars. While Serious Cigars was originally founded as an online store in 1996, it now operates four of the largest cigar retail stores in the state of Texas. Through this acquisition, both Serious Cigars and Tabacalera should be able to grow and continue to expand their distribution. You may remember a recent report that the FDA had banned cigar donations to U.S. soldiers. This seems so absurd that many in the cigar community held out hope that the ban was some kind of a mistake. But the Wall Street Journal has reported that the ban was not made in error; it was a deliberate action by the FDA. That’s right—U.S. soldiers can get themselves killed or injured in action, but they cannot accept your gift of stogies. In one few positive regulatory developments this past week, Lane County, Oregon (home to the city of Eugene), has become the latest to reject a smoking ban in parks. Two factors helped to decide the commission against the ban; the first is the fact that it would’ve resulted in smoking bans in 240 campgrounds, which would have made enforcement quite thorny. The second is the concern that the new decree might have been used as an excuse for law enforcement officers to harass the homeless. Last week, the Council of the District of Columbia voted to make age 21 the new minimum for tobacco purchases in Washington D.C. Anyone who violates the new decree will be fined $25. On the upside, this fine was going to be $50, but thankfully there was an amendment which lowered it to a more reasonable amount. The new minimum purchase age will go into effect in 30 days after being signed by Mayor Muriel Bowser. Thanks for checking in for this week’s updates! Be sure to check back with us soon for more!